Our Monday farewells to our dear family from the Bible College was tinged with sadness. However there was also a profound sense of gratitude, and warmth of spirit that had been encountered every step along our mission experiences throughout the week. 1. The 55-year dream to build new toilets in a remote village has been completed. 2. The vision to establish a kindergarten at a church in a small town will commence from 2014 with the funding and building of a boundary fence for the children’s safety about to be completed. 3. 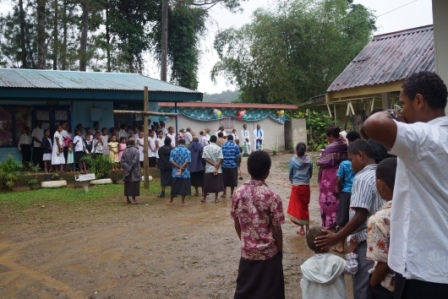 A theological church library has been established with the donation of 50 books. 4. Children’s storybooks collected are going to be distributed to outer Fijian Island communities by Fijian youth in October. 5. Sports equipment and stationery were donated to Bishop Kempthorne Anglican Primary School. 6. 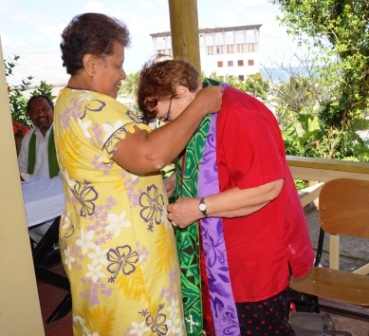 Knitted clothing and blankets are being dispatched to families in Suva by the Anglican Cathedral family. 7. First aid equipment donated is being used to replenish first aid kits at the Bible College. 8. Medical equipment of blood pressure monitors and stethoscopes are being donated to a local Medical Centre. 9. 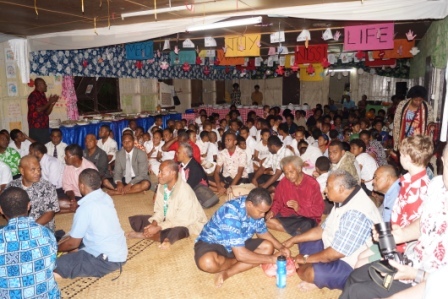 Encouragement for an environmental project by Fijian youth at St Luke’s to cleanup a local beach covered in rubbish and take on a custodial care for it, with support from the Council has commenced. 10. A new Educational Scholarship Programme was launched. This is to assist students in remote villages, in partnership with their families and Basden College, to enable these students to be enrolled and secure a secondary school education. So far commitments for 12 students for 2014 have been pledged by the Golden Oldies and residents at Archer Care and Archer Village. 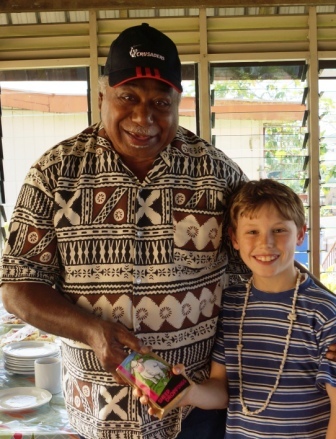 Our ‘Junior Golden Oldie’ Lukee thanks ‘Uncle George’ with some traditional Kiwi ‘Sheep droppings’!!! And along with this, there is a desire to support the e-learning with the student laptops from the University of the South Pacific to be introduced into the Fijian schools; to partner with Basden College to establish its vocational training centre to enhance future employment linked-training; and foster further missions that can transfer skills and strengthen partnerships between the Golden Oldies and our friends in Polynesia. Finally we want to acknowledge the support from Rev. 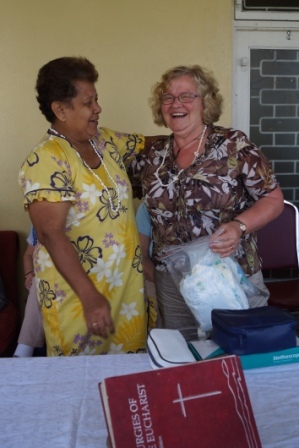 Amy Chambers and Jo Senagar for their partnership in Fiji; Steve Maina, National Director NZCMS; Archer Care and Village residents; Anglican Missions Board; and of course all the wonderful Golden Oldies themselves. Its been a great and inspiring mission. 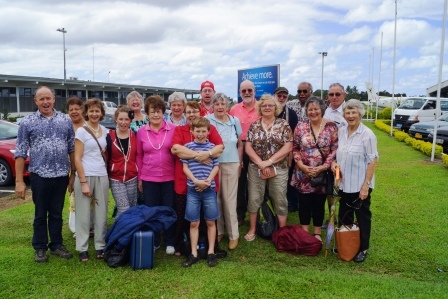 Vinaka from the Golden Oldies Team 2013! Its official –the toilets are open for business! Deep down on the valley floor is a remote village called Wailoku. 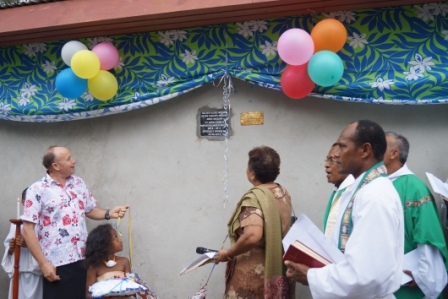 It is predominately Melanesian-Fijian, and finally after 55-years of waiting, the dream to build new toilets was now becoming a reality. 2013 the dream becomes a reality! 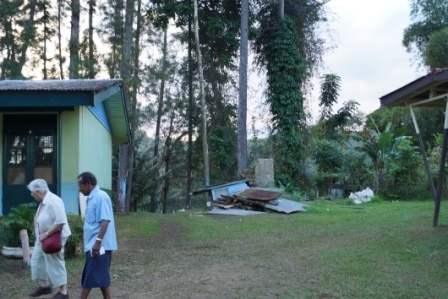 Last year the Golden Oldies were asked if they would partner with the St John’s Parish to build these toilets. Now a year later, in partnership, and with a wonderful effort in the last week from Allan, Grant and Tim, and the local village men, the toilets were completed. Time for the grand opening. And that’s exactly what happened, an official blessing for the opening, a church service with a stunning dance from the children and youth, followed by a village banquet celebration. It was an honour and humbling experience for this team to represent everyone at this special and historic occasion. A well earned bit of ‘R&R’ was enjoyed by all. 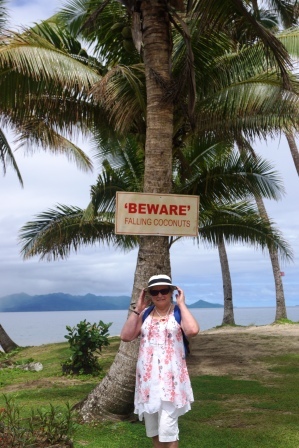 Reflecting on the mission encounters, the partnerships fostered, swimming, walking the palm-tree lined beach, strolling around the local village with its craft stalls, was a refreshing time for everyone. 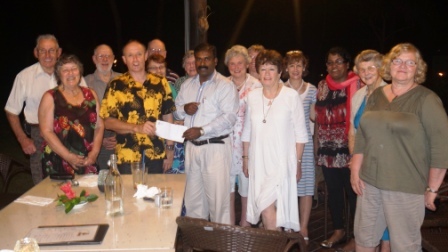 The team also hosted Father Daniel and Catherine from Singatoka for dinner to make a special presentation. A cheque, from fundraising by the Golden Oldies and supporters, towards completing the fence surrounding the church so that a kindergarten could start there beginning 2014. 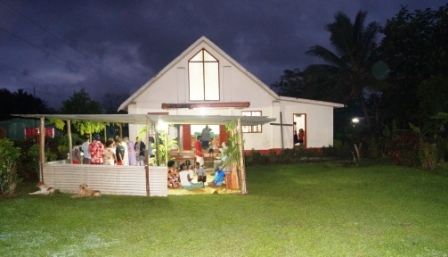 The following night we were welcomed by another local Church community for an evening service and meal. They too have big dreams for their church expansion. 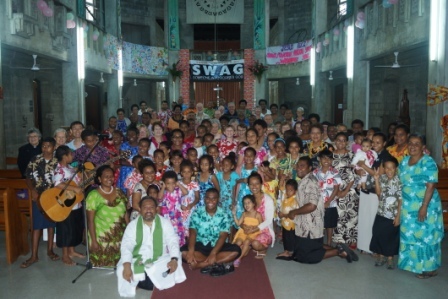 Sunday and the team left early for the first-ever ‘Bula Service’ at the Anglican Cathedral in Suva. A wonderful service full of colour, with the children performing songs and dance as well. Now time to prepare for the trek out to a remote village for the official toilet opening and celebrations in the afternoon.